Meaningful human connection is at the core of a doctor’s work; it’s the secret of a happy life. 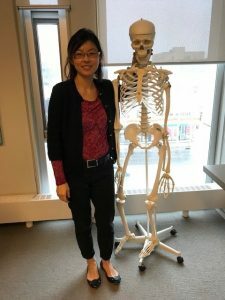 To Catherine Tong, relationships are at the core of family medicine – and connections between doctors are vital to patient care. It makes for a busy life as well. Catherine, 39, is the lead family physician at the Grand Valley Institution for Women, a federal prison in Kitchener, Ontario. She also clocks Emergency room night shifts at Grand River and St. Mary’s hospitals in Kitchener, and leads faculty development for McMaster’s Waterloo Regional Campus. To support faculty development, she recruits doctors who will pass along their clinical skills, and then trains them as teachers. “Teaching adds a new identity and a new layer of complexity to a doctor’s work, but it’s worth the trouble,” she says. The doctors learn to lead a team, speak in public and coach. Catherine graduated high school in downtown Toronto and completed a degree in human biology before attending medical school at the University of Toronto and residency at the University of Western Ontario, in London, Ont. She and husband Steven Chan, also a family doctor, had three children by 2015, when she became regional education leader in Emergency Medicine for the Waterloo Regional Campus of McMaster University.